Whenever we’re feeling diet-minded—or simply want to detox from the rich foods we eat all day, we whip one up. If you can get to a club store, artichoke hearts and hearts of palm are more affordable. Some people serve hearts of palm on a crudités platter with dip, or deep fried with dipping sauce. But that, to us, covers up the delicate flavor of the hearts of palm, which at best need only a light touch of vinaigrette. Hearts of palm are the edible hearts of young palm trees. Palm branches are harvested and cut; the bark and leaves removed to expose the tender inner core. Hearts of palm have a smooth, firm consistency, a snap to the bite, and a flavor similar to artichoke; they can be used in as a substitute for artichokes in a recipe. They can be either white or pale yellow, depending on whether the palms are wild or cultivated. Hearts of palm have only 50 calories per cup, is a great source of dietary fiber and is a good source of protein, riboflavin, potassium and, vitamin C, folate, calcium, iron, magnesium, phosphorus, manganese, copper and zinc. The only caveat: They can be packed in water with a high sodium content. 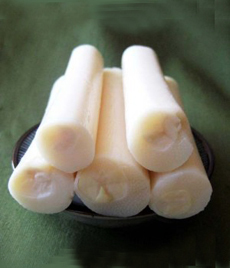 Due to poaching in Brazil, Ecuador is now the largest producer and exporter of hearts of palm. Costa Rica is the largest exporter of to the U.S, and Hawaii also produces some palm hearts.